Clare O’Malley, Kevin Toniazzo-Naughton, and Melissa Joy Hart (back). Just after you’ve settled into your seat at the Delaware Theatre Company (DTC), you’ll find yourself staring into a dark tunnel with a train coming toward you at breakneck speed. 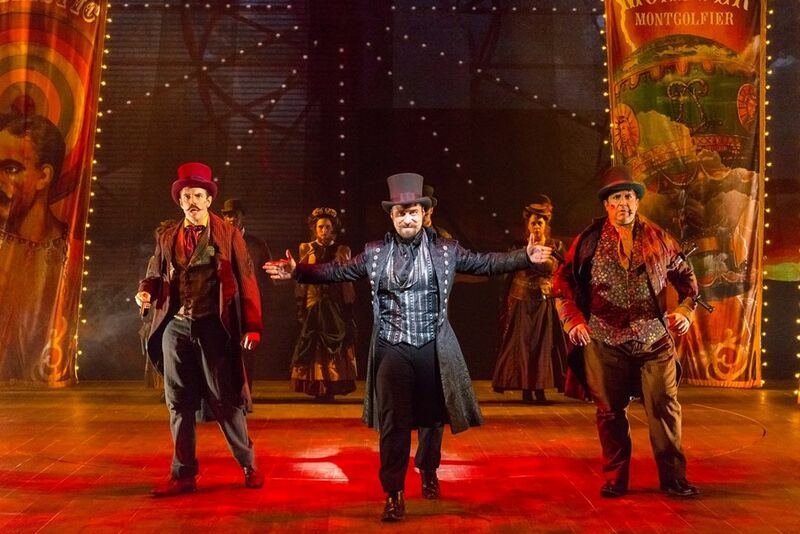 The locomotive seemingly thunders right into the audience and kicks off the electric new musical, Something Wicked This Way Comes. Based on the classic best-selling novel by Ray Bradbury, director/choreographer Rachel Rockwell deftly steers this delightful new musical about a traveling carnival’s mysterious visit to a small Illinois town. Neil Bartram (music and lyrics) and Brian Hill (book) have composed this coming-of-age thriller that draws heavily on the supernatural. The story revolves around young heroes Will (John Francis Babbo) and Jim (Sawyer Nunes), who are constantly bored in tiny Greentown. Compounding their perpetual search for adventure is each boy’s lack of a loving father figure – Jim’s has left and Will’s doesn’t seem to acknowledge the son living under his own roof. Veteran television and stage actor Stephen Bogardus portrays Will’s dad Charles as a quiet and unhappy man who yearns for his deceased wife Beth’s (Clare O’Malley) company, not his living son’s. What’s comin’ is a traveling show that suddenly appears in town and is led by mysterious ringmaster Mr. Dark (Rob Riddle). Mr. Dark seems to prey on human insecurities and the townsfolk flock to the carnival tents to fulfill their inner desires. Riddle is the standout performer in this show. His maleficent actions and full baritone are sinfully delightful. Like in a silent movie, you want to both boo and hiss Mr. Dark while simultaneously cheering the entertainment of his villainy. Bartram’s music and lyrics work to advance the story and include ballads, upbeat numbers, and operatic melodies which are effective as solos, duets, and chorus numbers. While you won’t go home humming any of the tunes from the show, you will be skipping happily out of the theater from the enjoyment of the experience. The show is dazzling because of projection designer Shawn Sagady and the technical wizards from Freckled Sky. The multimedia creatives have pulled out all the stops with immersive special effects that will wow any theater-goer. Scott Davis has designed a brilliant set that combines a Norman Rockwell-like town with a sinister carnival. Whether mesmerized in a hall of mirrors or receiving 200,000 volts of electricity or engaged in a rooftop battle with an evil balloonist(! ), these technical geniuses have outdone themselves. The action, blocking, and timing have to be perfect for these visual marvels to be successful – and they are. The set, actors, music, and effects are wonderfully synchronized. The Cooger and Dark’s Pandemonium Shadow Show song (none of the songs are listed in the program) was a highlight of the show. The carnival is rolled out to the people of Greentown with rousing choruses, snappy movement, and breathtaking special effects. The ensemble cast is first-rate and most of the actors have secondary roles as townsfolk like barber Mr. Crosetti (Christopher Sapienza), tobacconist Mr. Tetley (Jake Blouch), and schoolteacher Miss Foley (Marian Murphy). Meghan Murphy plays the blind soothsayer known as the “Dust Witch” to wicked perfection. Through a series of startling discoveries and harrowing experiences, Charles eventually gains self-awareness, faith, and a backbone as the story progresses. The boys fight to save their futures, their relationships, and their lives from all kinds of nefarious attacks the “Autumn People,” led by Mr. Dark, throw at them. In the end, the town is saved as is Charles’ paternal bond with Will. But for this show, it’s the journey not the destination that is most appreciated. Something Wicked This Way Comes is DTC’s fourth development of a new musical following Because of Winn-Dixie, Tappin’ Thru Life and Diner. This is a World Premiere event, so some tweaking may take place during this initial run or after its completion. 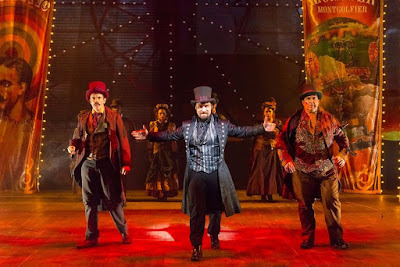 The performance schedule of Something Wicked This Way Comes is: Wednesdays (2:00pm), Thursdays (7:00PM), Fridays (8:00PM), Saturdays (2:00 & 8:00pm) and Sundays (2:00pm) through October 8. Tickets start at $25 with group (10+) and student discounts available. There will be pre-show Viewpoints on September 27 at 1:15pm, plus post-show talkbacks on September 28 and October 5. The running time is just over 2 hours with one 15-minute intermission. Call 302.594.1100 or visit DelawareTheatre.org to purchase tickets or for performance information. Delaware Theatre Company is located at 200 Water Street in Wilmington.